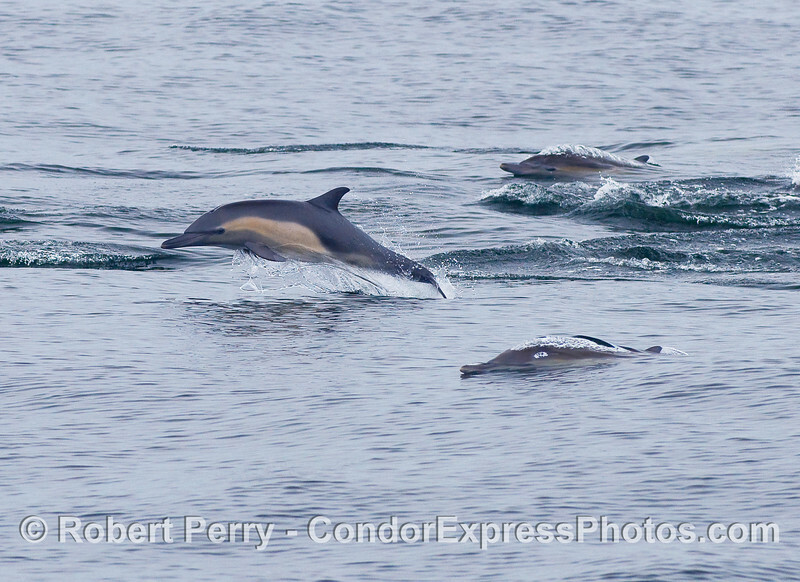 Blue Whales (Balaenoptera musculus), Humpback Whales (Megaptera novaeangliae), Common Dolphins (Delphinus capensis) and of course California Sea Lions (Zalophus californianus) all came to play on an overcast but calm and glassy trip up northwest of San Miguel Island. 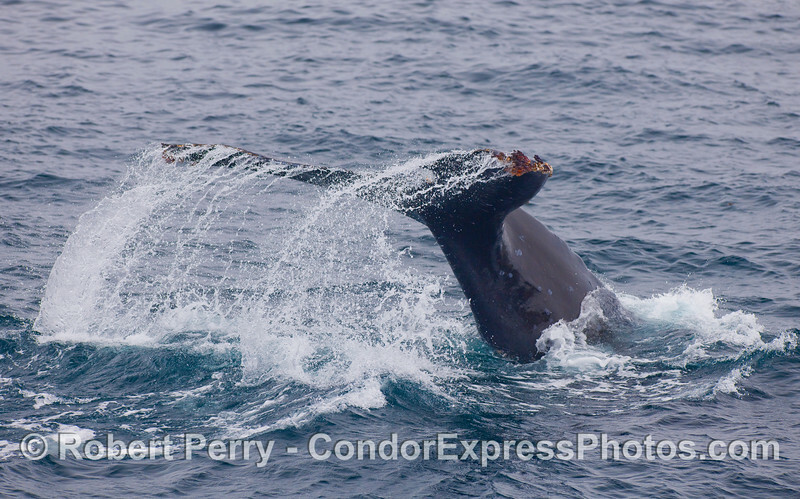 A large Humpback Whale kicks up its tail flukes. 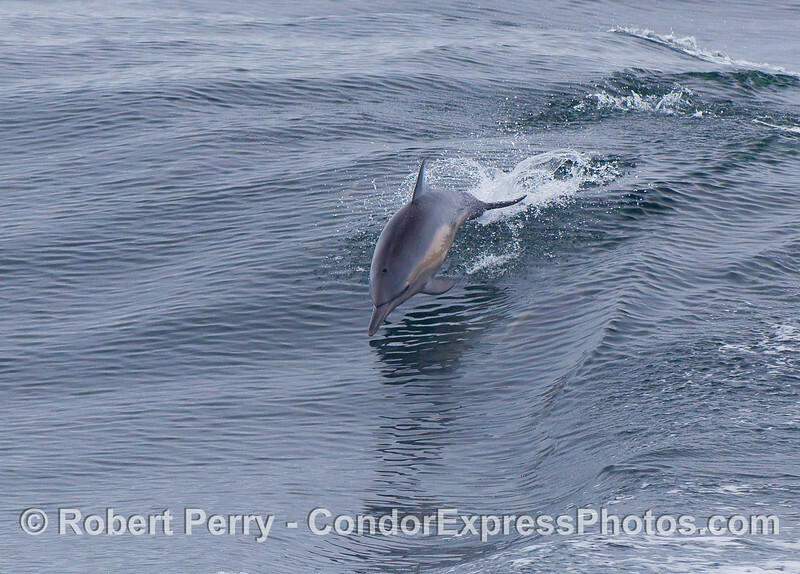 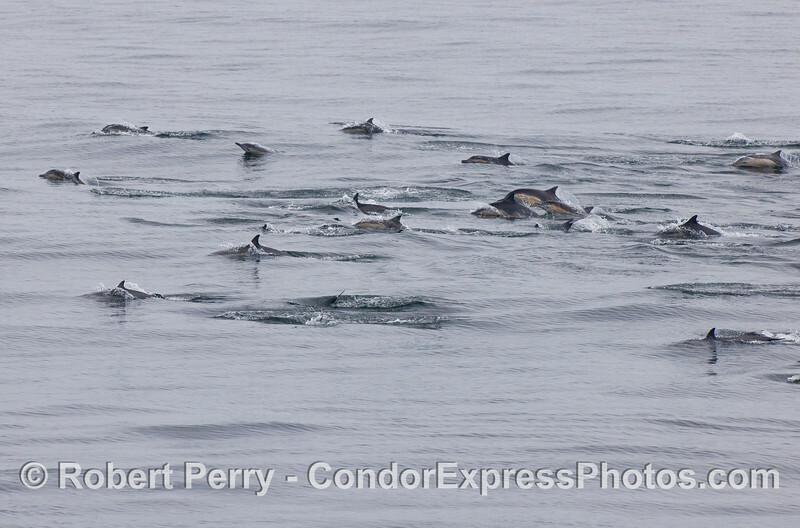 Common Dolphins visit the whalers so they can shoot them (with cameras, of course). 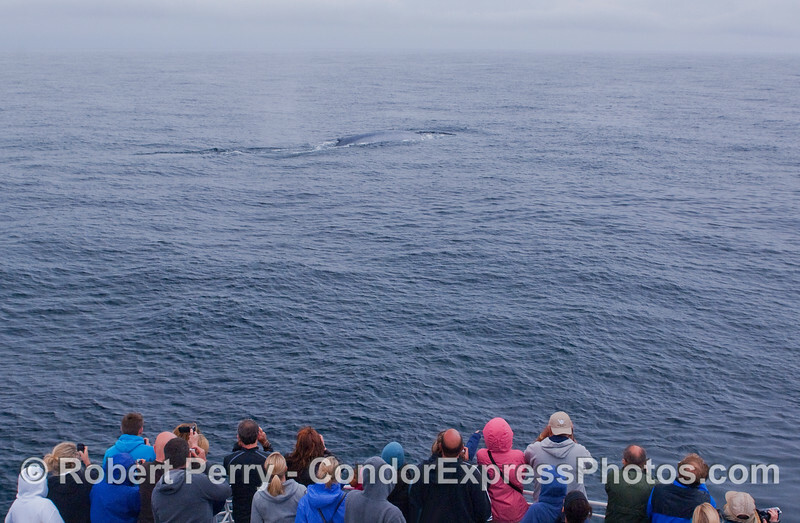 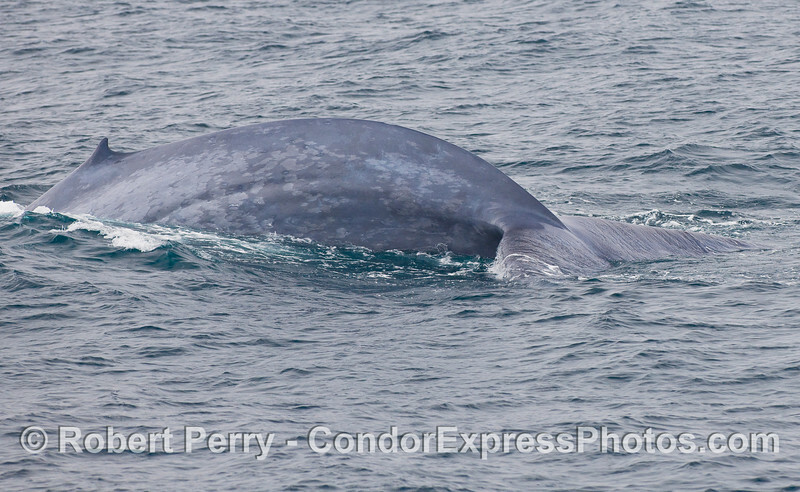 Whalers get a close look at a giant Blue Whale. 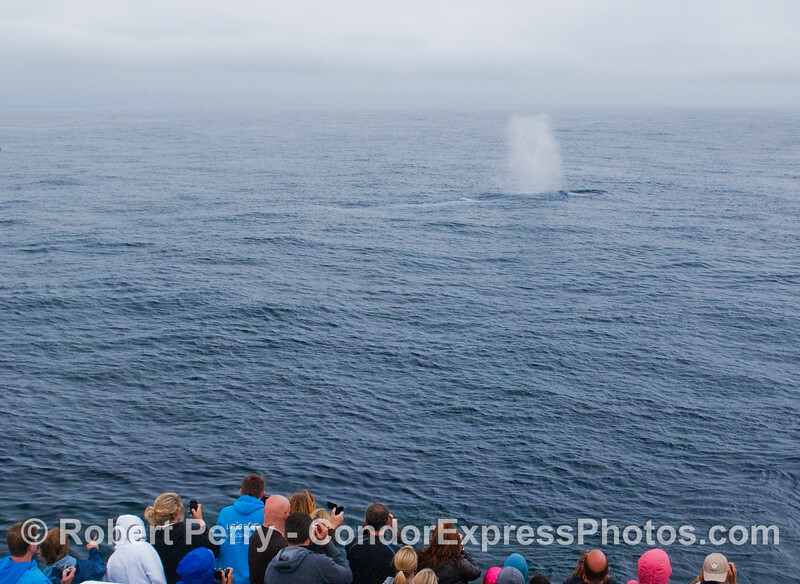 A mighty blast of air from the spout of a Blue Whale, as close as you'd ever want one. 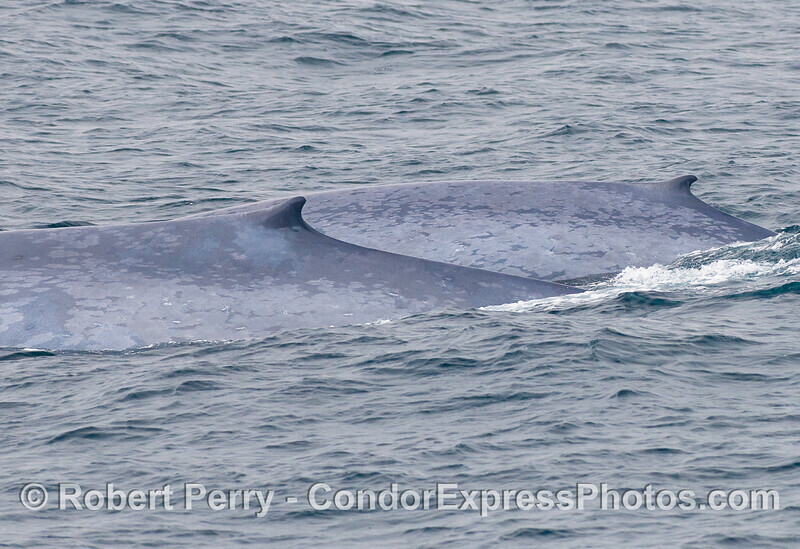 Two giant Blue Whales, side by side. 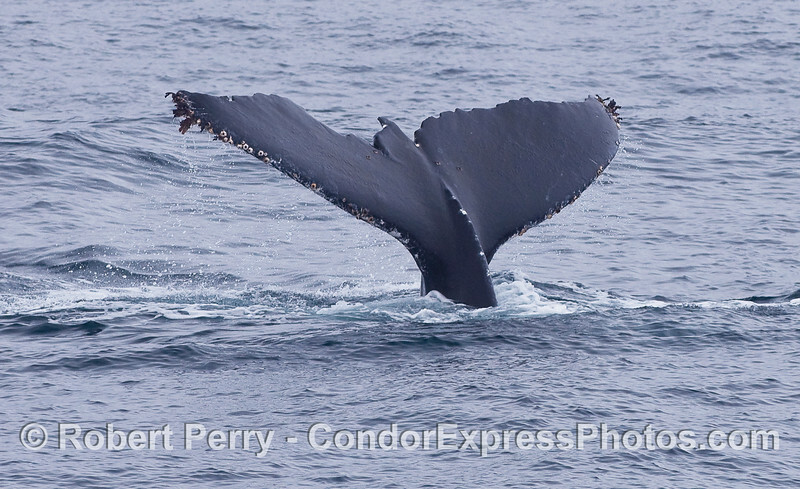 This Humpback Whale tail is badly chewed-up, perhaps from an Orca attack. 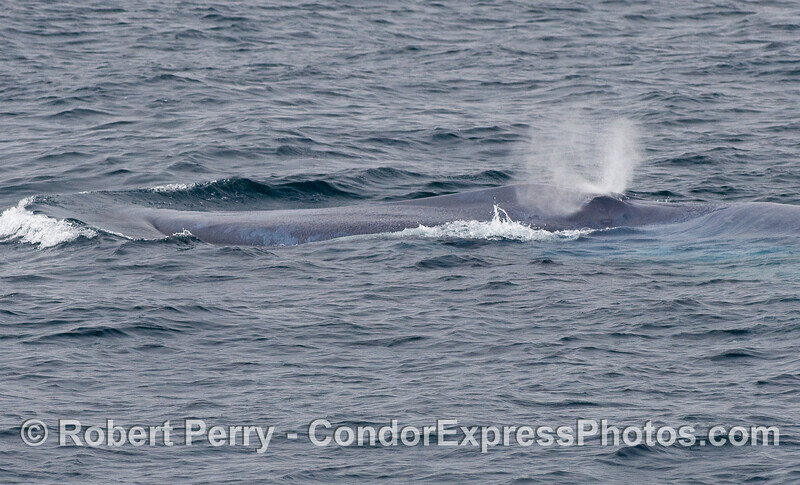 A Blue Whale pushes a bow wave ahead of its rostrum. 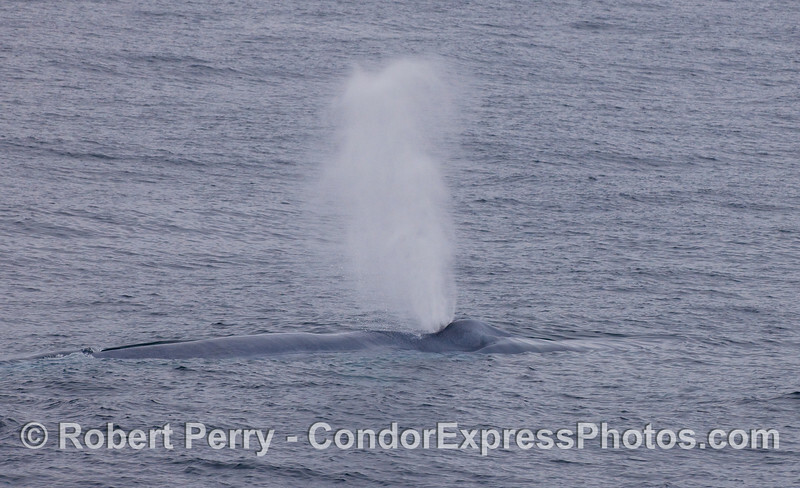 Rostrum (left side) and spout of a Blue Whale. 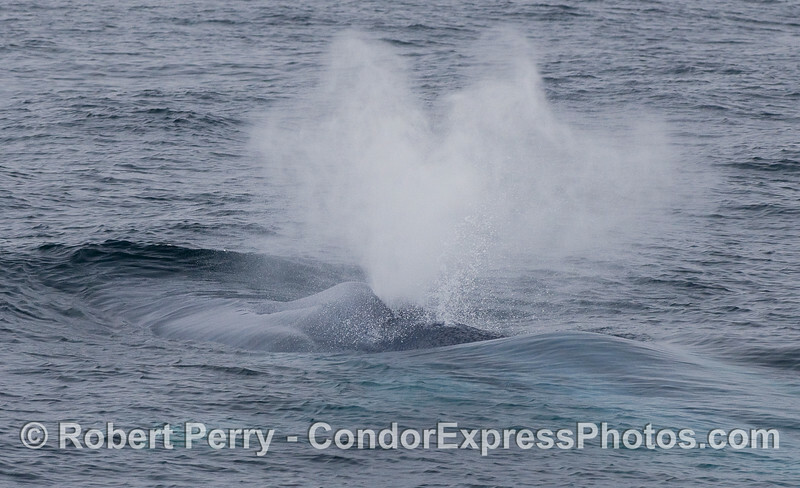 The characteristic tall column of spray from a Blue Whale's spout. 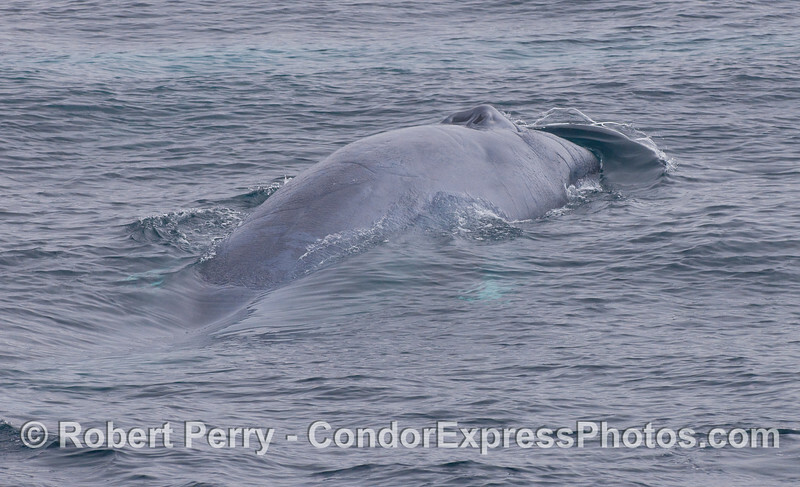 A beefy Blue Whale tail. 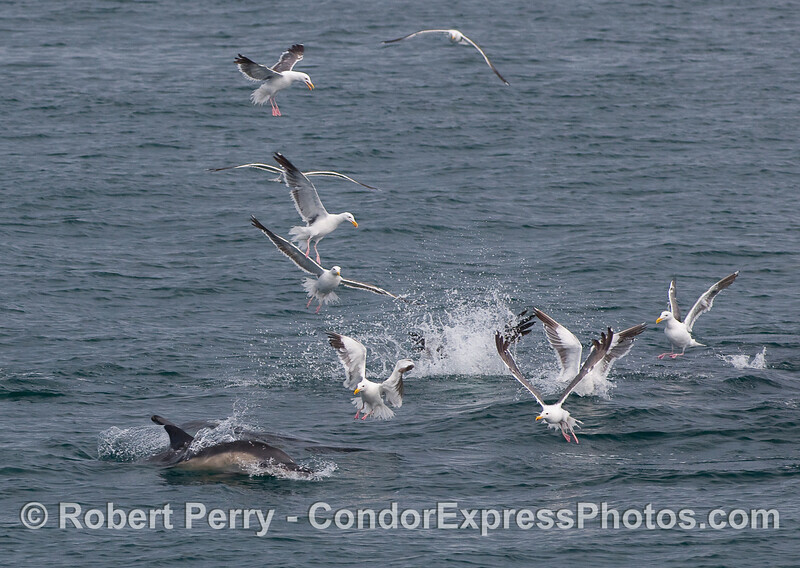 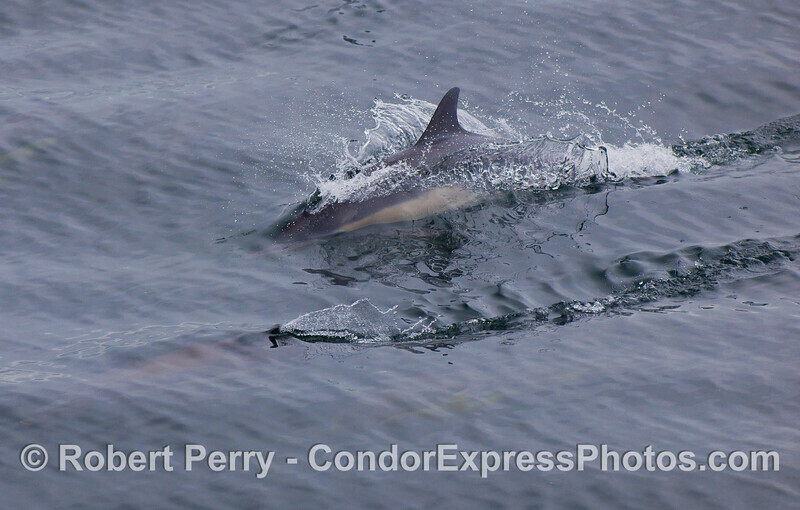 Common Dolphins feeding. 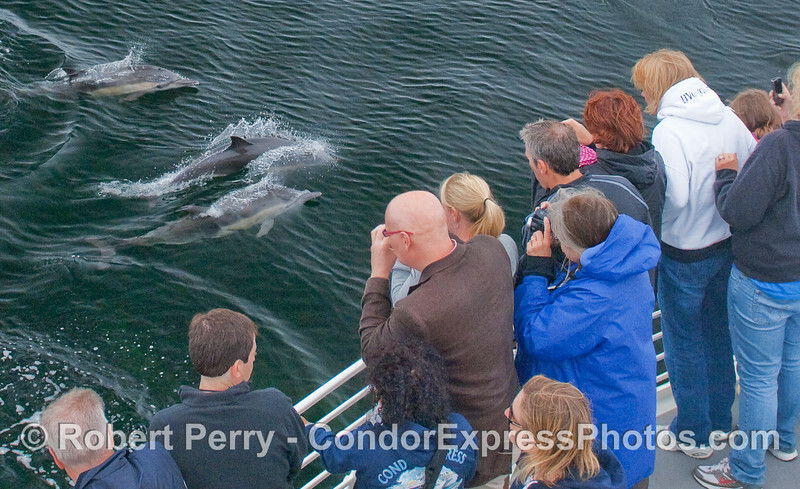 This always attracts a crowd. 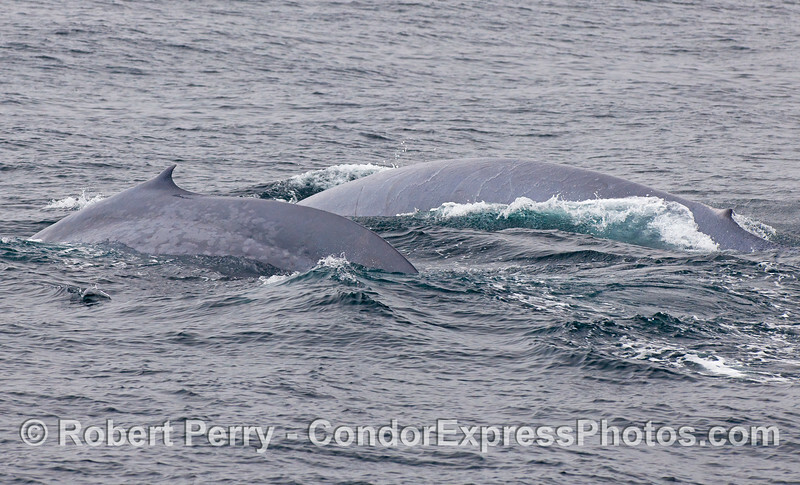 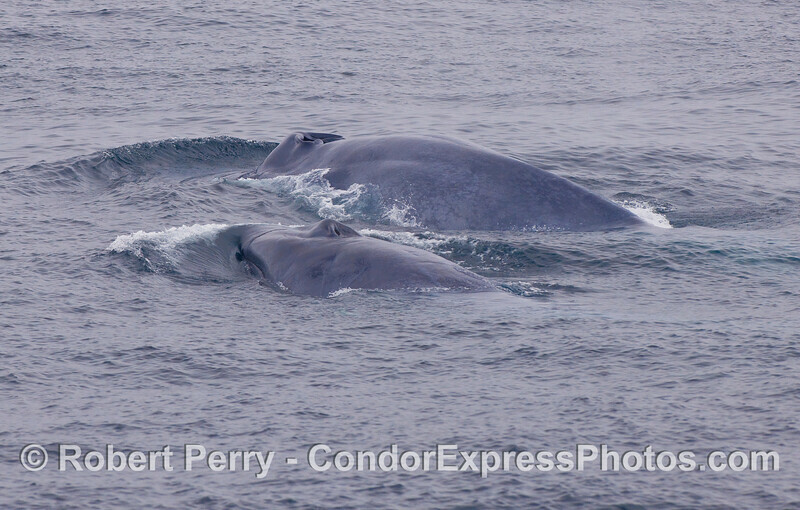 Two more giants - Blue Whales side by side. 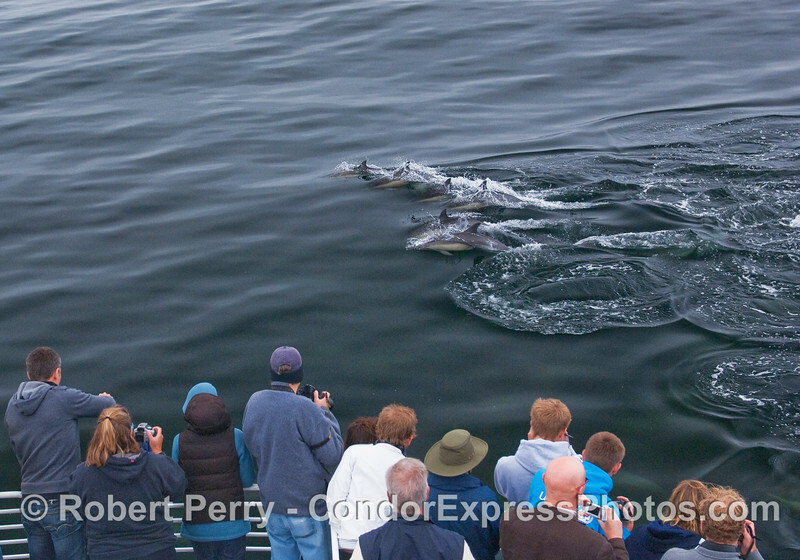 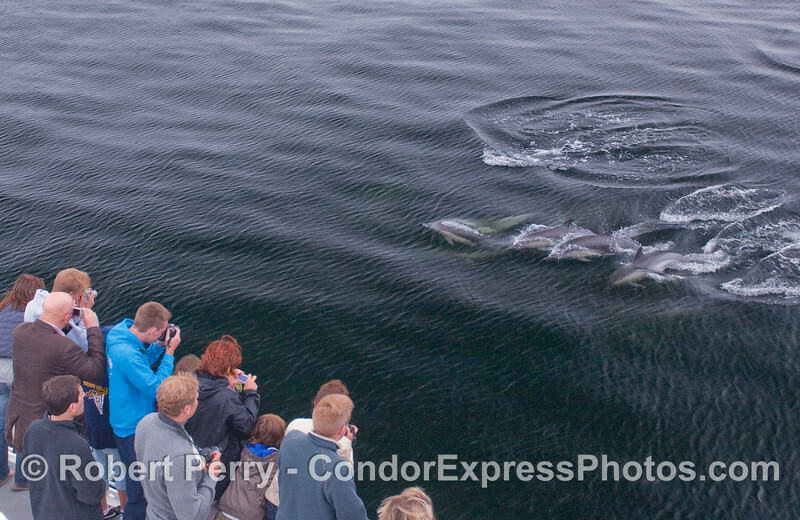 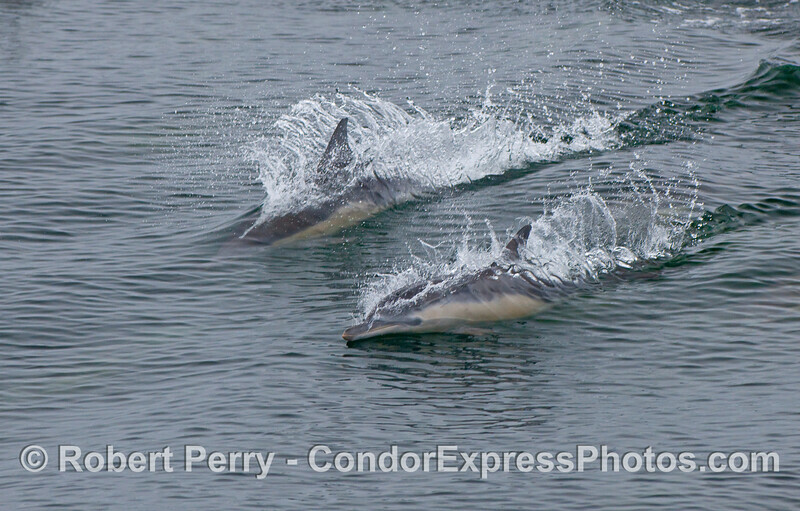 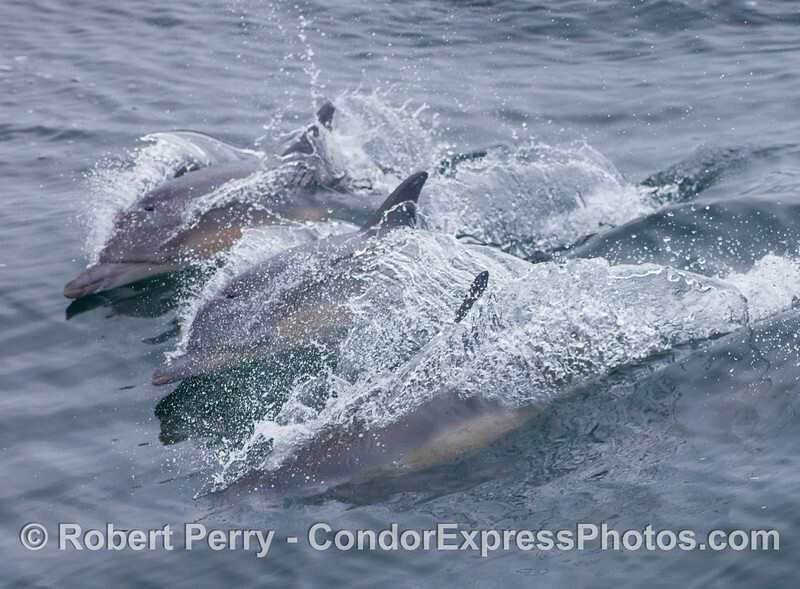 Friendly Common Dolphins come by and introduce themselves. 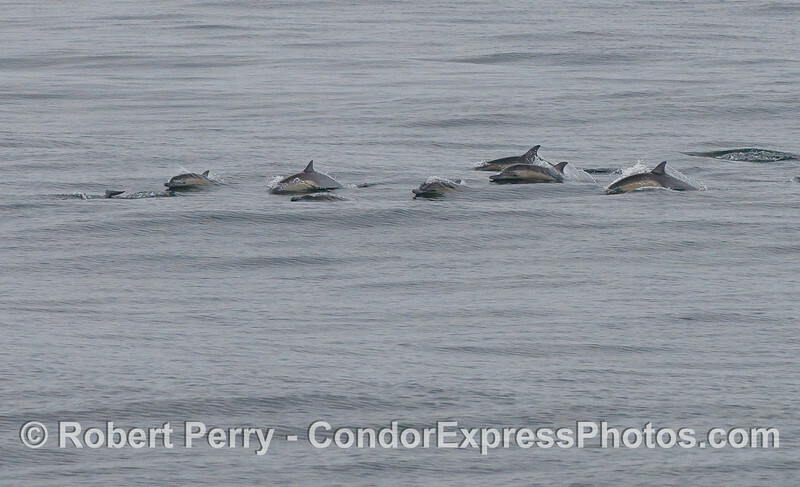 A long line of Common Dolphins. 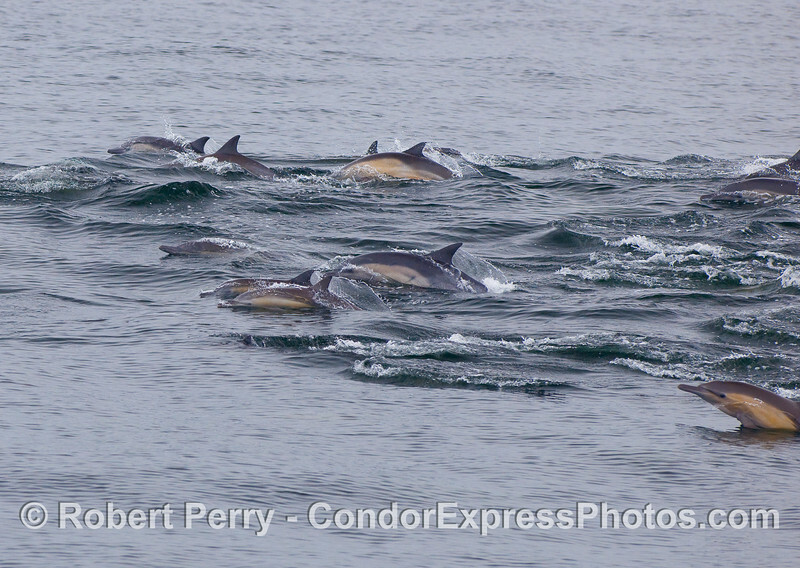 Closer look at a batch of Common Dolphins. 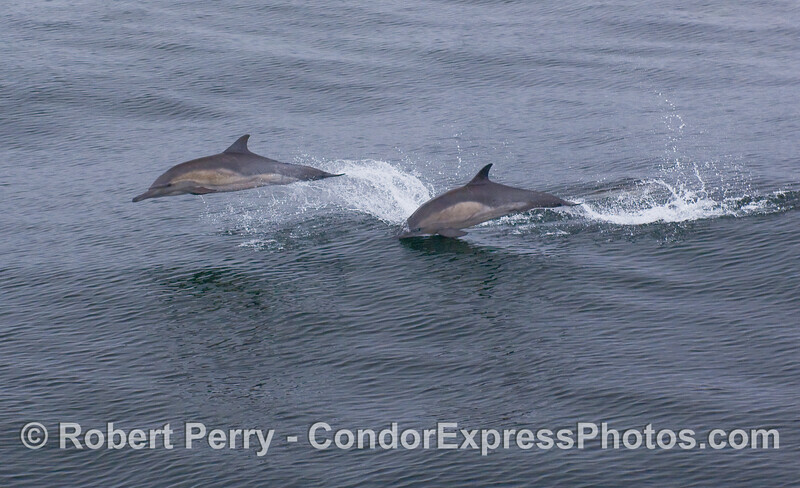 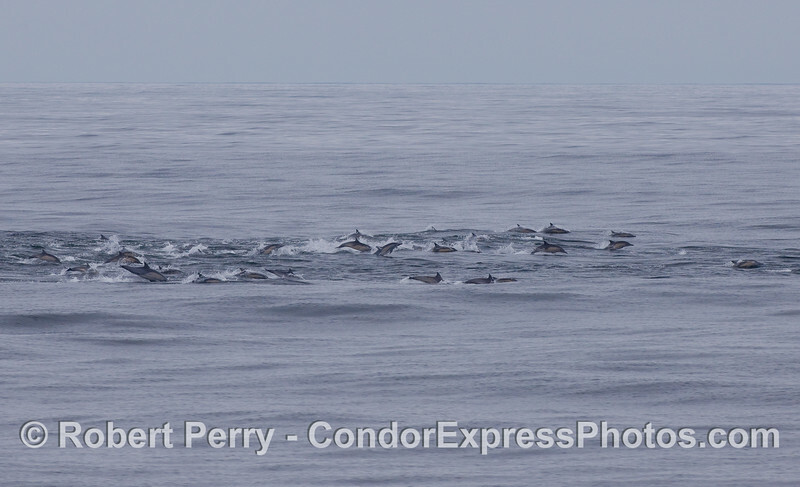 Common Dolphins on the move. 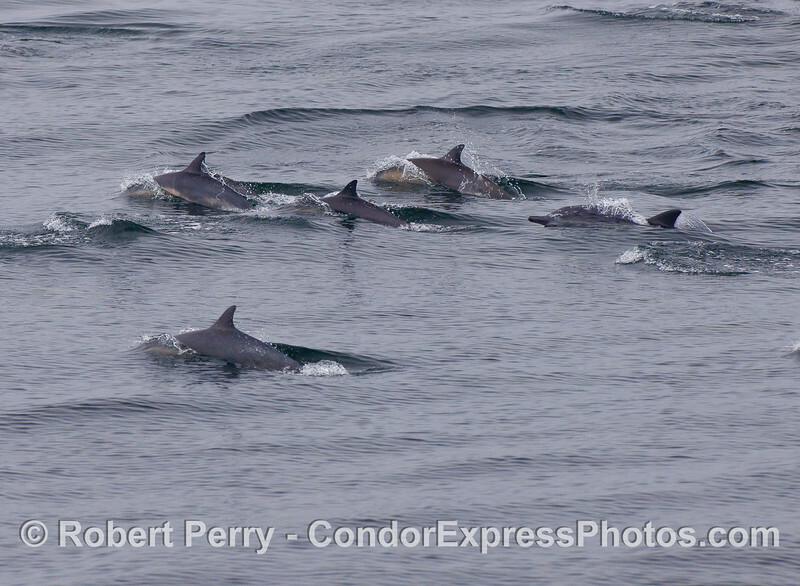 A close look at part of the herd. 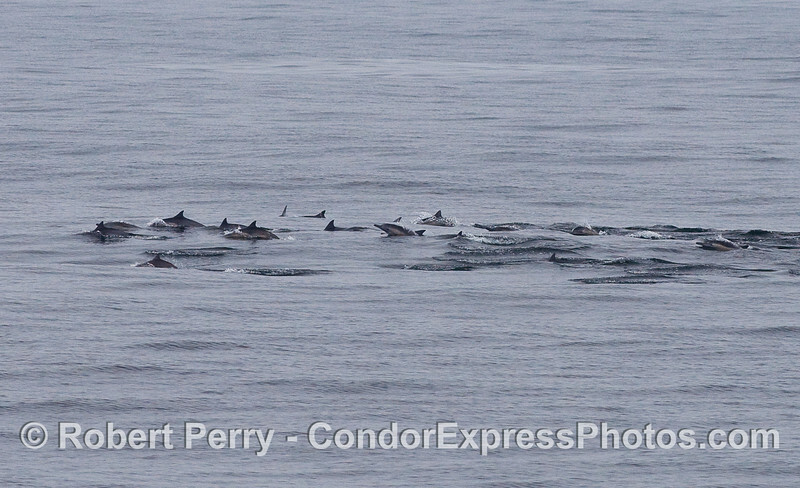 Masses of Common Dolphins on the move. 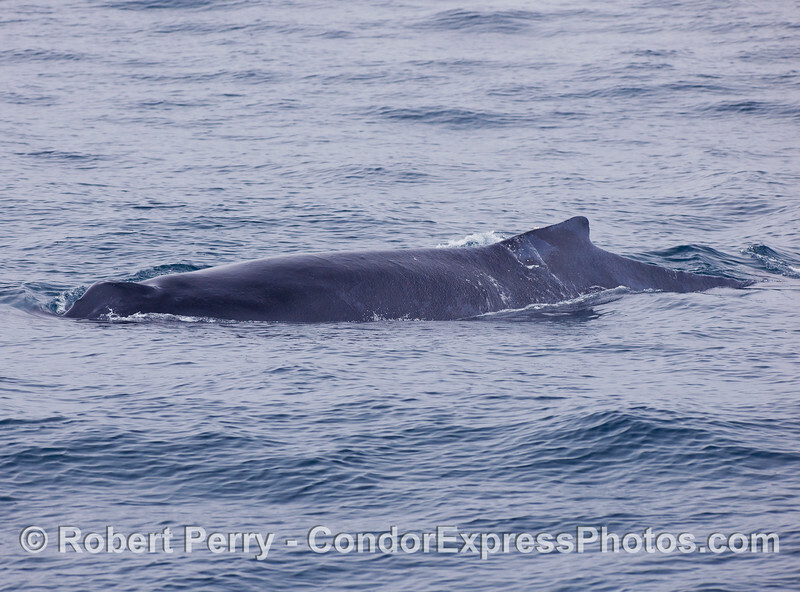 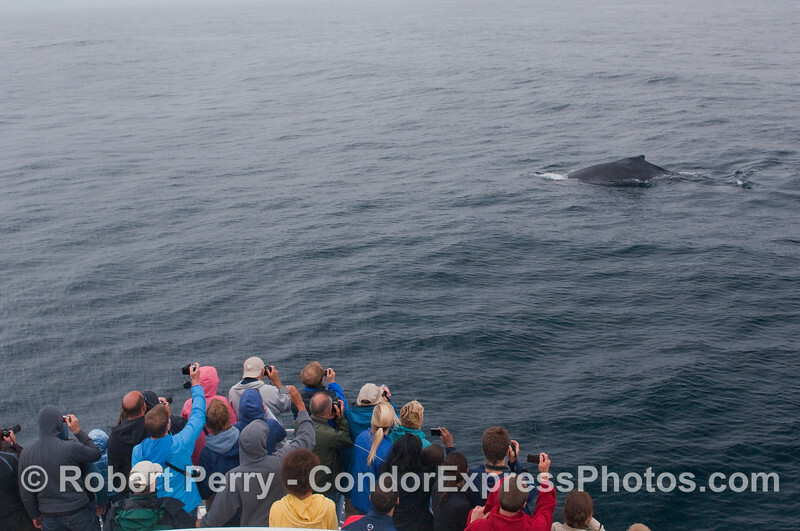 Whalers on the Condor Express get close to a friendly Humpback Whale. 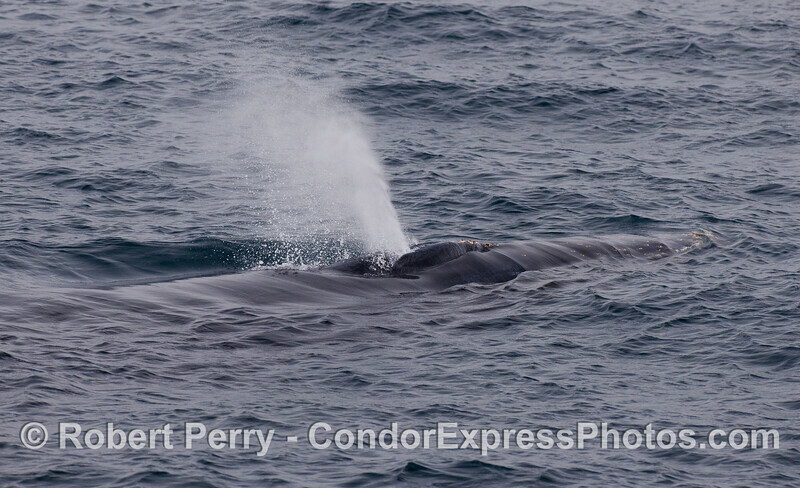 Head and spout of a Humpback Whale. 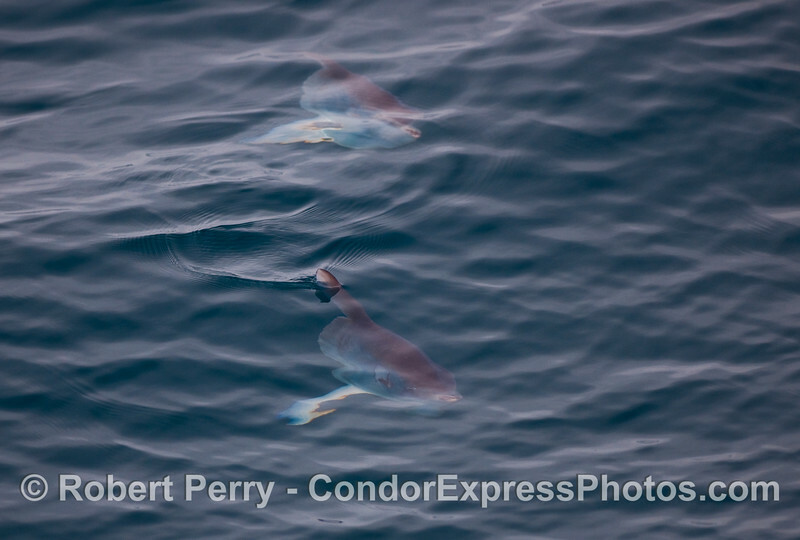 Two very small, young Ocean Sunfish (Mola mola). 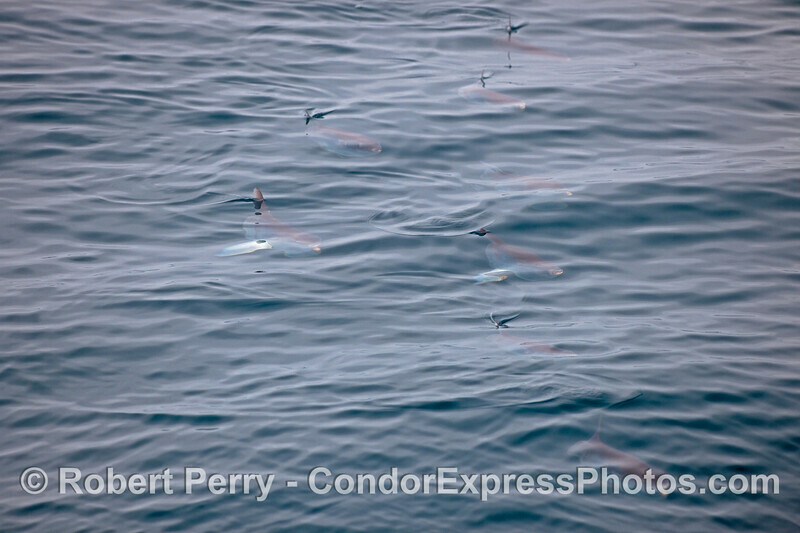 Eight out of the ten very small, young Ocean Sunfish (Mola mola). 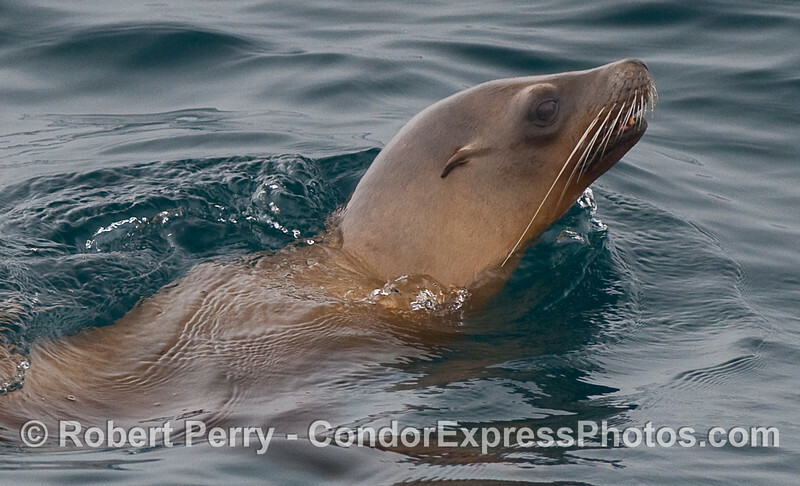 My mascot - the California Sea Lion.